Ariana Grande is an American singer and actress born in 1993 in Boca Raton, Florida. She played the role of Charlotte in the Broadway play 13 in 2008. Grande also played Cat Valentine on Nickelodeon’s show Victorious. Her debut album Yours Truly debuted at number one on the Billboard Top 200. The single The Way made it to the top ten on the Billboard Hot 100 and reached double platinum status. Grande reveals the cover art for Focus, a black-and-white photo of her with platinum blonde hair and black fingernails. I feel like in the apology I posted, I missed my opportunity to sincerely apologize and express how I was feeling because I was too busy preaching about my issues with the food industry. I could have expressed myslef in a better way. Here I am apologizing again. I’ve actually never been prouder to be an American, to be honest with you. Advances that we’ve made in the past couple of months and all the wonderful progressive things that have been going on, I’ve never been prouder of this country, actually. Seeing a video of yourself behaving poorly — that you have no idea was taken — is such a rude awakening, that you don’t know what to do. I was so disgusted with myself. I’d like to shove my face in a pillow. I apologize for my poor choice of word and for my behavior. I am EXTREMELY proud to be an American and I’ve always made it clear that I love my country. What I said in a private moment with my friend, who was buying the donuts, was taken out of context and I am sorry for not using more discretion with my choice of words.,,As an advocate for healthy eating, food is very important to me and I sometimes get upset by how freely we as Americans eat and consume things without giving any thought to the consequences that it has on our health and society as a whole. The fact that the United States has one of the highest child obesity rates in the world frustrates me. We need to do more to educate ourselves and our children about the dangers of overeating and the poison that we put into our bodies. We need to demand more from our food industry. However I should have known better in how I expressed myself; and with my new responsibility to others as a public figure I will strive to be better. As for why I cannot be at the MLB show, I have had emergency oral surgery and due to recovery I cannot attend the show. I hope to make it up to all those fans soon. That being said let me once again apologize if I have offended anyone with my poor choice of words. Ariana Grande — Tongues New Boyfriend & Donuts!! They both care deeply for each other and remain close friends. We kindly ask that the media respect their wish for privacy regarding this personal matter at this time. Grande does a Celine Dion impression on The Tonight Show Starring Jimmy Fallon. Grande appears on the cover of the February 2015 of InRock magazine. Grande performs Last Christmas during Michael Buble’s Christmas in New York special. Buble and Grande perform Santa Claus Is Coming To Town on Michael Buble’s Christmas in New York special. Grande appears on the cover of the December 2014 issue of In Style magazine. She talks about her famous elevator f-bomb story and what she loves for her look. Polka dots and hair bows – I can’t. Give me a skinny jean, a YSL top, and a cat ear, and we’re good. Seacrest interviews Grande during On Air With Ryan Seacret about her single Santa Tell Me. I wanted to do something a little more depressing because I feel like there aren’t enough depressing Christmas songs. I feel like it’s a very real thing. I’ve been through it, I’ve seen a lot of my friends go through it, like breakups during Christmas time. Grande performs the single, Bang Bang, with Little Big Town at the 48th Annual CMA Awards. Grande releases a sneak peek of her upcoming video for the song Love me Harder. Grande appears on the cover of the October 2014 issue of Marie Claire magazine. She talks about early ambitions, hiding behind her Nickelodeon character, and her first single not doing well. I was like, ‘Guys, there has to be a really distinct difference between me and my character.’ And we did that with ‘The Way.’ I dyed my hair back to brown. I made out with a rapper in the video. I made the point I wanted to make. And I was excited to do so after so many years of pretending to be somebody else in front of a lot of people. Grande appears on the cover of the September 2014 issue of Seventeen magazine. She talks about lessons she learned, the toughest thing she’s dealt with, and how she gets over her insecurities. Being okay with not having the answers to everything. I feel like for the first time in my life, I’m really okay. I used to freak out about everything all the time. I used to be like, ‘Oh my God, somebody said this!’ Everything used to be such a big deal! But now, I feel I can handle everything that comes my way with a calm energy. Grande performs Bang Bang on The Today Show from her album My Everything. Seacrest interviews Grande during a On Air With Ryan Seacrest and asks her questions about Nicki Minaj’s VMA wardrobe malfunction. I don’t care. That was amazing. She’s such a pro for coming on, holding her [stuff] together like that and just, like, living and rapping and keeping it together. That was amazing. I thought she did incredibly well, especially given the circumstance. She also reveals her next album’s title, My Everything. I felt like A), it was one of my favorite songs on the album, and B), it was just all-encompassing. I felt like it really sort of embodied the work. And yeah, it just felt right, really. Grande performs Break Free on America’s Got Talent to promote her album My Everything. Power 106 FM interviews Grande about a possible collaboration with Chris Brown. I am waiting to hear back from him whether it will be on his new album or not. It warms my heart. I feel like all the hard work has paid off, and the reactions make me feel like I’m doing my job right. Grande performs her singles Break Free and Bang Bang in the opening act of the 2014 Video Music Awards. Grande is joined by Jessie J and Nicki Minaj during the performance. 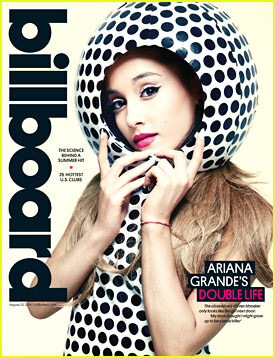 Grande appears on the cover of the August 2014 issue of Billboard magazine and talks about her role models; Helena Bonham Carter, Freddy Krueger, Marlene Dietrich and Madonna. [Madonna] is strength, she is freedom, she is wisdom beyond anybody’s comprehension. I have an obsession with all things vintage and classic and old-school. Grande releases the music video for her single Break Free. The single is a collaboration with Zedd. Grande releases a snippet of her song Love Me Harder, which will be featured on her second studio album. The song features a collaboration with The Weeknd. It has not been an easy few months. Jai just wasn’t as supportive as he could have been. She’s gearing up for her album release so she’s focused on that. 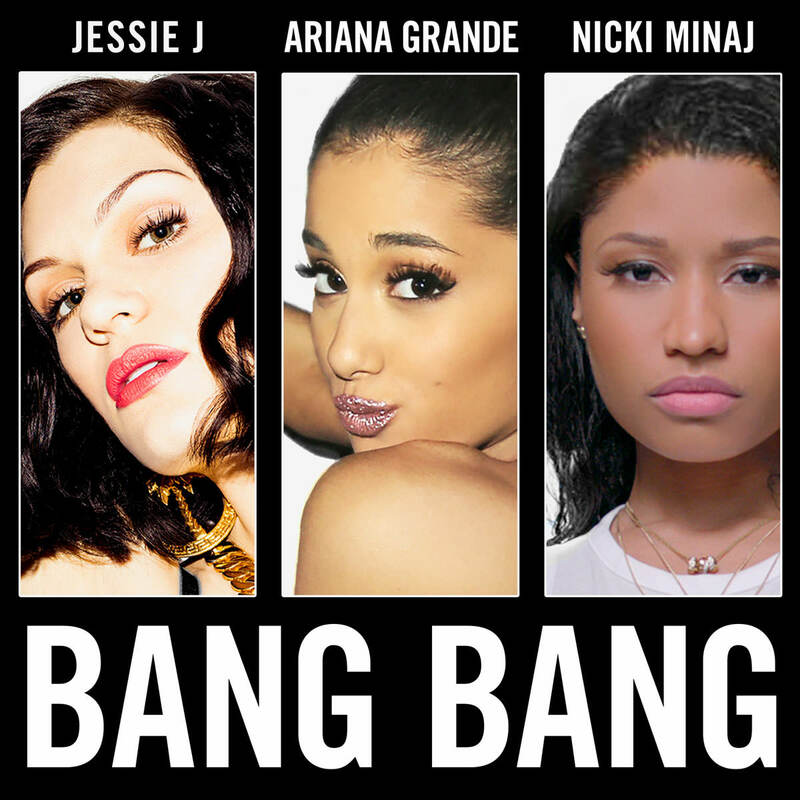 Grande releases single Bang Bang. The single is a collaboration with Nicki Minaj and Jessie J.
Grande releases her single Break Free. The single is a collaboration with Zedd and will be featured on her upcoming album. Grande gives a surprise performance at the 2014 iHeartRadio Ultimate Pool Party. Grande’s set includes her singles The Way, Right There and Problem, which will be on her upcoming second album. Grande releases the video for Problem. The video is directed by Nev Todorovi is inspired by sixties fashion. Azelea raps, and Big Sean, appears in a cameo. Grande performs Problem during Dancing With The Stars to promote her album Yours Truly. Seacrest interviews Grande during On Air With Ryan Seacrest and questions her about what she wants her second single to be released. I did a song with Zedd, who I just met for the first time. I really want that to be the second single. My whole team is like, ‘Oh, it’s too early to pick a new single,’ but I’m really I love that song so much. He’s fantastic and the song is really fun, and it’s very different for me especially. Grande performs Problem during The Ellen Show to promote her album Yours Truly. Grande performs Problem and The Way at the iHeart Radio Music Festival to promote her album Yours Truly. Seacrest interviews Grande during On Air With Ryan Seacrest and questions her about her single Problem. I’m so excited about it. As for the song’s “bipolar” message of a love-hate relationship, Ariana adds, “I feel like once you get to that point, it’s either you break up or you just work it out and you stay for a while. Grande gives debut performance of her single Problem at the Radio Disney Music Awards. The artist performs Problem at the award show. Grande performs I Have Nothing at the Women of Soul: In Performance at The White House Concert from The Bodyguard soundtrack. Grande appears on the cover of the February 2014 issue of Teen Vogue magazine. She talks about her crazy life and doing a theatrical version of Miley Cyrus’s song, We Can’t Stop. It sounded funny to hear ‘we all so turnt up’ in an operatic voice. I was making myself laugh so hard. I think I find myself funnier than everybody else might. Grande appears on the cover of the February 2014 issue of Cosmopolitan magazine. She talks about being a positive role model, her first date with boyfriend Nathan and making a name for herself. I never really expected to be taken seriously as an artist, and it’s just been the ultimate, proudest achievement. I’ve dealt with a lot of people not knowing what to expect from me because of my age and my personality. People often mistake my kindness for weakness, and they didn’t expect much from me, because at the end of the day, I’m just a nice Italian girl from Boca. Grande performs Tattooed Heart during the American Music Awards to promote her debut album Yours Truly. MIKA and Ariana Grande perform Popular Song during Dancing With The Stars to promote their albums Yours Truly and The Origin Of Love. Grande releases debut album Yours Truly. The 12 track record features collaborations with MIKA, Mac Miller and Big Sean. Grande’s single The Way is also featured on the record. Everybody on the record is a very close friend of mine. Mac Miller came about because I heard The Way and I was like, “Oh my gosh. This song is amazing. Malcolm, will you come be on this record with me?” and he was like, “Absolutely.” I went over to his house. I engineered the session. I recorded him rapping, while I was simultaneously baking cookies for him and that was that. Grande releases music the video for her single Baby I. The video pays homage to the 90’s, the decade that Grande was born in. Fallon and Grande perform Broadway versions of Jay Z‘s 99 Problems, Cypress Hill‘s Insane in the Brain and Macklemore & Ryan Lewis Thrift Shop. Grande performs Tattooed Heart on The Today Show from her album Yours Truly. Grande guest stars in a sketch on the MTV show Nikki and Sara Live. In the sketch, Grande tells Nikki and Sara’s employees what Nikki and Sara are too scared to do themselves through song. 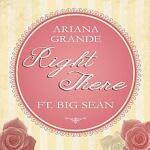 Grande releases the third single off of her album Yours Truly titled Right There. The single features a collaboration with Big Sean. I love it. I can’t say it’s one of my favorites on the album because they’re all my favorites, but it’s really cool and he (Big Sean) killed it. I love his verse. 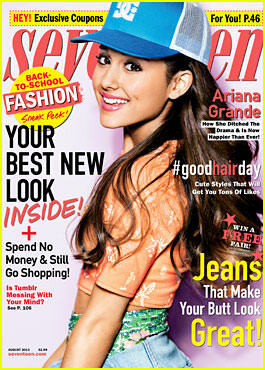 Grande appears on the cover of the August 2013 issue of Seventeen magazine. She talks about why she’s still working on her album and her insecurities. I worked with someone who told me they’d never like me. But for some reason, I just felt like I needed her approval. So I stared changing myself to please her. It made me stop being social and friendly. I was so unhappy.